The INDIGO and EPFX/SCIO - Quantum Biofeedback Systems, the latest and most up-to-date technology, take a multitude of stress reduction programs, methods, and techniques, and merge them into a more simple - best overall - well rounded approach to wellness. Quantum Biofeedback, working through sixteen different electrical factors of the body, calculates combinations of impedance, amperage, voltage, capacitance, inductance, and resistance for Electro-Physiological Reactivity (The Xrroid Process). The body is indeed electric; therefore reactivity in the body can be measured electrically. E-P Reactivity results are based upon the ability to establish a “Tri-Vector” connection for an energetic “3-Dimensional” view of the client's current reactions to over 10,000 different items, all accomplished completely independent of user influence to help avoid bias or error. The picture painted by the reactions creates a better understanding of the individual factors pertinent to lifestyle and wellness. Once established, the Quantum Biofeedback auto-focus program, designed to monitor a client's reactions, helps optimize the quality and quantity of the stress reduction results. The techniques and methods of Quantum Biofeedback stress reduction include addressing those areas most typically affected by the stressors of everyday living. Examples of these methods are the “Tri-Vector”, “auto-meridian”, “auto-frequency”, “auto-color”, “auto-spinal”, “chakra”, and “brain wave pattern relaxation”. 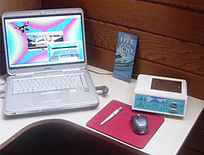 An initial session with the INDIGO or EPFX/SCIO takes approximately three hours, which allows for the completion of the intake form as well as the Suppression and Obstruction to Cure or “SOC” panel, which identifies lifestyle issues and medical history and helps cue the biofeedback device to any particular risks for the client. It is an overall value calculated by the device to reflect the client's impediment to healing. The lower the score, the fewer impediments to healing. Once the SOC panel is completed, the client is connected to the selected device with a head harness and limb straps. The device is then calibrated and the test scan proceeds for about four minutes, measuring the resonance or response of the body to over 10,000 items (including minerals, vitamins, toxins, allergens, viruses, pathogens, organ functions, etc.). Follow-up sessions are approximately two hours or more and involve a review of the “SOC” panel to determine if there have been any lifestyle or symptom changes to report. Once this is accomplished, the session proceeds as before, continuing therapy according to the client's needs and the wellness plan established after the first session. The INDIGO and EPFX/SCIO devices are used worldwide by Doctors, Kinesiologists, Dentists, Veterinarians, Naturopaths, Chiropractors, Homoeopaths, Acupuncturists, Nutritionists, Psychologists, Hypnotherapists, Biofeedback Technicians, Massage Therapists, and many other professional practitioners. In addition, many people from all walks of life own and use Quantum Biofeedback Systems, depending on their own personal or professional needs. The INDIGO and EPFX/SCIO systems are simple to use and come with excellent support materials such as help manuals and tutorial DVD's and CD's. In fact, the inclusive library of available information is an education in itself. The systems are extremely portable; they can be used in a small office, a client's home, or at an exhibition booth. CLICK HERE if you would like more information and/or are interested in purchasing one of the Quantum Biofeedback Systems. We make it easy for you to be an owner of this fantastic technology. In addition to providing the means to receive the INDIGO or EPFX/SCIO Technology and related products, Athena Leadership Center is wholeheartedly dedicated to providing comprehensive service and support to our clients, in all facets of the use, promotion, and training. No claims are made of the INDIGO or EPFX-SCIO system or its results and nothing that the SCIO Practitioner does, diagnoses or treats any illness or disease nor replaces any other treatment. Please consult your family medical doctor for the diagnosis or treatment of disease. Please also consult your family medical doctor before undertaking any health program.